Bryan Daniel with the program he wrote Wednesday April 13, 2016 at his home in Navarre, Florida. WUWF's Bob Barrett talks to Dr. Robert Hoyt, an instructor in the College of Health at UWF, about the new diabetes database. As with all chronic diseases, an important aspect of diabetes treatment involves maintaining the necessary comprehensive prevention and management programs to control the disease. Because of their inherent transitory nature and the fact that a large portion of their client base suffers from diabetes, maintaining these programs becomes a particular challenge for free, walk-in clinics totally supported by donations and staffed by volunteers. The problem is magnified in most people because of a lack of funds for a computer-based records program. Free clinics are not eligible for federal electronic health record incentive plans. At Our Lady of Angels St. Joseph Medical Clinic in Pensacola, this hurdle has been significantly lowered. Bryan Daniel, a recent University of West Florida College of Science and Engineering graduate, and the clinic’s Dr. Norman McFadden have developed a Web-based registry. It manages the clinic’s approximately 170 patients who have Type 2 diabetes and related disorders. The database is modeled after the Chronic Disease Electronic Management System, which has been in use since 2002, and the recommendations of the American Diabetes Association. It includes screenings, check-ups, monitoring and coordinating care, and patient education. 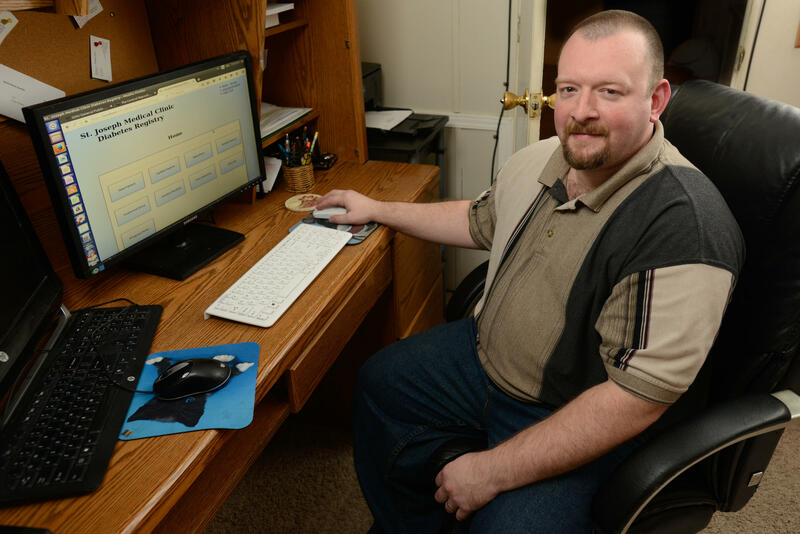 Enhancements to the software include features that allow it to be also used as a simple electronic health record, and the Web-based configuration allows other clinics to share the software. The Escambia County clinic was established in 2002 by a small group of local doctors and parishioners. Fulfilling its mission to provide medical and dental services for uninsured, low-income patients, it had more than 8,000 medical patient and 622 dental patient visits in 2015. Approximately 69 licensed health care providers and 31 general staff volunteers account for more than 20,000 volunteer hours per year. What makes the computer program even more exciting, said McFadden, is that “it can be easily shared and used by other small clinics in similar financial situations.” There are more than a 1,000 free clinics around the U.S.
Dr. Robert Hoyt of UWF’s College of Health wrote a paper about McFadden and Daniel’s project, and will present this innovative diabetes registry program to the American Medical Informatics Association iHealth Clinical Informatics Conference May 4-6 in Minneapolis. Dr. Hoyt said he wrote the paper because he thinks that the creation of the diabetes computer program is an excellent example of how UWF can collaborate with the Pensacola community to innovate and provide expertise to communities of need. This article is part of a collaboration between WUWF and the UWF Center for Research and Economic Opportunity. More than 180 exhibits representing the gamut of research were on display Thursday at the University of West Florida Student Scholars Symposium. The annual event held at the UWF Field House highlights the creative and scholarly work of graduate students, undergraduate students and faculty at the University. At one time, Lou Brock was the fastest man in Major League Baseball. He had over 900 stolen bases, including one season when he swiped 118. Last month, the 76 year old Hall of Famer had his left leg amputated just below the knee, the result of an infection made worse by diabetes. According to the latest numbers from the CDC, over 29 million Americans are living with Diabetes, and over a quarter of them don’t know it. And when you have diabetes, you not only have to check your blood sugar and insulin levels. You also have to check your feet. The 2016 UWF Faculty ADVANCE Showcase, held April 8, offered a chance not only to reflect on the program’s achievements in growing the ranks of women in fields of science, technology, engineering and mathematics, but also to look toward the future. Governor Rick Scott replaced two members of the 13-member University of West Florida’s Board of Trustees which appears to be related to attempts to expand industry statewide. Garrett Walton, the CEO of Rebuild Northwest Florida and Susan O’Connor, president of O'Connor Management Group, have been succeeded by Greg Britton, CEO of Fort Walton Machining, and Bob Sires, founder and CEO of Bay State Cable Tires in Crestview. Walton says higher education is undergoing a major transformation.